Kargil, September 10 (Scoop News)- The five-day annual Scouts and Guides Camp 2018 concluded here at Khree Sultan Cho Sports Stadium today. The programme was organized by the J&K State Bharat Scouts and Guides District Headquarter Kargil. On the occasion, Deputy Commissioner and Chief Executive Officer, LAHDC Kargil, Vikas Kundal, who is also President of J&K State Bharat Scouts and Guides District Kargil, has impressed upon the volunteers of the organization to put in their best to keep the torch of the movement afloat so that its message reaches every corner of the State. While congratulating the participating students, the DC hoped that they will learn more and also asked them to participate in such events in future also. The DC also went around the camp and witnessed the exhibition. He interacted with the participating students. Later, the Deputy Commissioner and Superintendent of Police, Kargil Dr Vinod Kumar distributed certificates among the participating students on the occasion. 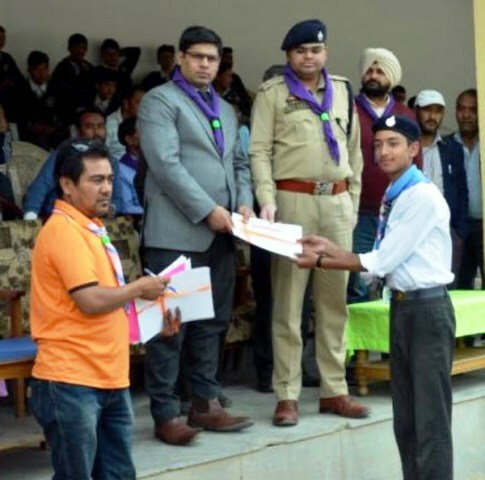 Earlier, the Secretary, J&K State Bharat Scouts and Guides District Kargil, Mohammad Shabir in his welcome speech highlighted the achievements of Scouts and Guides Kargil. The function witnessed a number of cultural songs and skits performed by Scouts and Guides of various schools registered with the J&K State Bharat Scouts and Guides, Kargil. A two-minute silence was observed in the memory of ex-workers of the J&K State Bharat Scouts and Guides including Hajji Habibullah War, Aga Syed Hussain Lamboo and Syed Mustan Shah. Among others, Chief Education Officer, Kargil Mohammad Mussa, Assistant Director Information Kargil, Abdul Ahad Bhat, District Youth Services and Sports Officer, Mohammad Hussain Rahnuma, senior officers of district administration and other concerned were present on the occasion.